Join us for a month-long community reading event featuring Stuart Dybek's The Coast of Chicago. The public libraries in Bloomingdale, Itasca and Roselle are collaborating on this event and hosting a series of book discussions, movies, programs and events throughout October. Check out the October email newsletter for programs at Roselle Library or see the program brochure for a complete listing of events at all three participating libraries. Be sure to "Like" the On the Same Page Facebook page for even more information. The Sixty-Eight Rooms by Marianne Malone is the featured title for children. Book discussions and programs for children are also planned at each library. 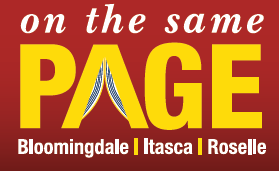 "On the Same Page" is sponsored by Itasca Bank & Trust, Friends of the Bloomingdale Public Library, Rotary Club of Bloomingdale-Roselle and Salerno Rosedale Funeral Chapels.